The second month of this blog is now concluded and if anyone is thinking of starting a similar project, I am sure they would appreciate some statistical information, insights into whether it is possible to earn money from site traffic, and an idea of just how fast a new blog can develop. The Internet contains a large amount of SEO (Search Engine Optimisation) advice and articles recommending how to increase a blog’s popularity, however there isn’t much information available confirming whether it works in practice. More so, I was curious to find out how other blogs have developed from the start-up phase, but on this subject I found hardly anything, hence this update. I would like to stress that I do not use any under-handed methods like buying back-links or traffic. The blog is growing organically through the publication of my own unique content and articles which are then listed by search engines such as Google and Yahoo. Leaving comments and back-links to Soccerwidow in other blogs is also helping, but finding relevant and appropriate places in which to do this is quite challenging and time-consuming, especially in the English speaking community. Alternatively, there are plenty of forums ready-made to receive my views and opinions but already, I have been banned from two English blogs (shortly after registering), purely because my back-links contravened their terms and conditions relating to self-advertisement. I also received a warning from a German forum and have for the time being stopped leaving back-links in any forums (this is of course contrary to all the advice I found in the Internet recommending back-links in forums in order to drive traffic!). I am seeing quite a fight for market share in the Internet and this is definitely something I hadn’t bargained for to such an extent. This month I also received a few dubious offers by email, which were all binned straight away. Soccerwidow has 112 regular readers from Germany and only 43 from the rest of the world (encompassing 28 different countries). My husband surmises that the English version of the blog is not performing so well because it has so much competition from other football related sites in the English language. The above table includes only three of Soccerwidow’s 63 active affiliate programs, all three of them showing similar good click-through figures, but with the same fat zero in the end column! Google AdSense refused my application as Soccerwidow.com links to gambling sites which offends Google’s terms and conditions. So far, the alternative Betvertiser, highly praised in the Internet, has not generated any income either. I will continue observing this for another month and if at the end of March there is still no positive development, I will think about removing all links to gambling sites and apply again with AdSense. However, as my site is definitely gambling related I hold out little hope of being accepted, but AdSense is the only provider paying per click, of which I have many. Update, April 2012: Google AdSense have recently changed their T’s & C’s and Google adverts are now allowed if the Web site is not an online casino or wagering site and also, does not drive organic traffic to gambling sites. 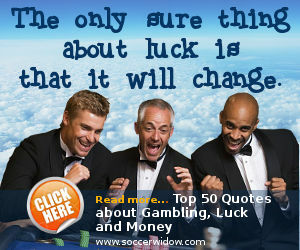 Blogs about gambling, including referral links or gambling adverts are okay. At this moment in time, my favourite idea is the latter and I’m thinking of offering coaching seminars in the coming summer break and possibly organising a European tour. If this idea generates any interest from likely candidates, then any income earned would allow the blog to run for free. I started with a bank of 50 € and have achieved a profit of +153% after just three weekends. However, although I am always sure that my computations are correct, I am quite risk averse. This means that I will only feel comfortable putting larger sums of money on my picks once I have checked the consistency of my computations in greater detail over many weeks, to ensure there are no mistakes in reasoning and that the past profit has indeed been no coincidence. With a blog one cannot immediately make fast, easy money, even if the visitor numbers rise exceptionally and those visitors click on many advertising banners. Affiliate programmes do not seem to be worthwhile at all, even if many of them offer generous commissions (some as high as 30-40%). Of course, if no-one registers with these affiliate partners after clicking on my links, even an offer of 100% commission would bring no income to Soccerwidow. Sites are quick in suspending accounts as soon as they think you are self-advertising on their forums, and some blog owners are not interested in co-operation; they even lock their sites to your IP address when discovering that you may have a competing interest in their site. The market share struggle makes it a dog-eat-dog environment with not many potential business partners wishing to cooperate. The Internet community seems very ‘cold’ as a result. 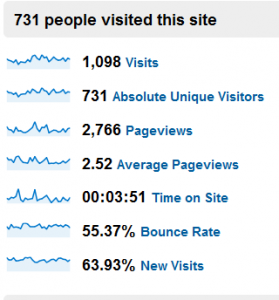 The absolute majority of visitors are passive readers and despite many regular visitors (e.g. 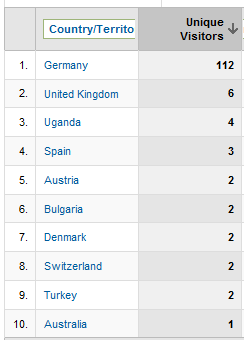 112 from Germany), only a handful have ever communicated with me and most seem to prefer anonymity: They are happy to vote on the betting poll I have posted on the site but resist communication by comments or email. I still find it amazing how fast my Alexa rank has risen in such a short space of time and I therefore must assume that most Web sites (over 90%) have less than 50 regular visitors per day. The topic is huge, and luckily I have hundreds of article subjects and ideas in my mind. Unfortunately, in order to maintain the quality of articles I cannot populate the site as quickly as I would like. WPML (the WordPress Plugin for multi-languages) is not compatible with the new WordPress 3.1 version and they have stopped providing upgrades for free. This means that one must now buy a license. In view of the very few visitors from non-German speaking countries combined with zero income from the site so far, I am hesitating with this purchase, which means the English version of my blog currently has an error when visitors try to navigate using categories. Everything else is running smoothly (touch wood! ), except that I’m bashing my head against a wall trying to come up with a feasible idea how to get paid for my hard work! March will hopefully see my blogging and statistical analyses translated into money. I will probably publish only part of the weekly picks free of charge and ask for a small payment for the rest. Looking ahead to June/July, as mentioned, I’m thinking of offering seminars in the form of a ‘Summer Academy’ and offering contents such as data evaluation, odds calculation, identification of ‘value’ bets, development and assessment of strategies; the duration of these seminars would probably be one week in different cities in Germany and Europe. 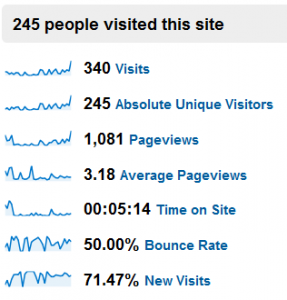 I have to assume that the number of visitors will continue to rise constantly and organically, and hope that my readers spread the word of Soccerwidow’s existence. Naturally, I hope I will not have to sell Soccerwidow, but instead as suggested in my opening salvo, Hello football widows and football widowers (article is in German! ), will succeed in making a living from the thousands of professional soccer games played each month and in general from the worldwide enthusiasm for the sport. The blog is still in its experimental phase and the primary goal is to make money from the site, ideally without having to bet myself. Paradoxically, however, it seems that betting myself might actually bring the most profit: Starting bank on 12.2.: 50 € – February: 126 € – Estimate for March: 360 € – Estimate for April: 800 €, and if my statistical approach continues to make a profit of 30% every week, at the end of the year, who knows?! Many thanks to all my regular readers, but the largest “thank you” to those who have helped me with their comments and votes, those who keep me ‘on the ball’ and motivated. Play to the final whistle, as they say!